If you check out the online version of the October 26, 2017, column that David Brooks wrote for The New York Times, linked right here, you will find that E Pluribus Unum is spelled out correctly. Not so in the hard copy version of The Times that was delivered to my front porch on October 27th. There, the phrase was spelled out erroneously, as in the headline to today's blog posting. 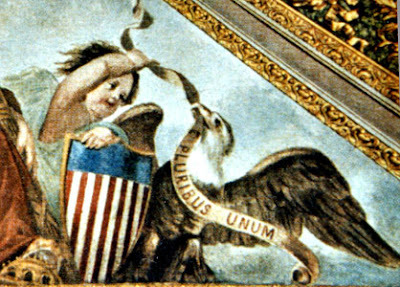 This statement, "E Pluribus Unum," as incorporated into the Great Seal of the United States, refers to the creation of a national government out of its constituent political parts: "Out of Many, One." In a more fundamental sense, however, it is well to think of this statement as a basic piece of intelligence about government and society in general. "We" are one: we are not just a collection of individuals, but a larger whole. My pitch, yesterday, was that our politics must not seek to smooth over or dismiss genuine differences or divisions within the body politic, but that politics is precisely the technique we use to resolve and decide contested questions. It is politics, in fact, that allows us to achieve the political goal we express in the slogan, "E pluribus unum." We become "one nation...indivisible" because we don't try to suppress our political conflicts and controversies, but seek, instead, to resolve them through political action. The profound equality of every individual was an idea that flowed directly from the Hebrew Bible. The story Americans told about themselves was a biblical story — an exodus story of various diverse peoples leaving oppression, crossing a wilderness and joining together to help create a promised land. America’s Judeo-Christian ethic celebrated neighborliness over pagan combativeness; humility as the basis of good character, not narcissism. It believed in taking in the stranger because we were all strangers once. It dreamed of universal democracy as the global fulfillment of the providential plan. Whether or not you think that Trump's America has brought us to the cusp of totalitarianism, and whether or not you like Brooks' reliance on the Hebrew Bible to explain the American experiment, Brooks' final words echo what I said back in 2010. Our nation cannot prosper, cannot even function as a democracy, if we come to believe that we are fundamentally and ultimately divided. Our nation, striving for "liberty and justice for all," is not defined by the fact that we are all individuals. We are, of course, but we also comprise a community, a "Unum," that binds us all together into "One." When we stop believing that, democracy will, indeed, no longer provide us with an effective government, and the trip to autocracy and totalitarianism will be a pretty short trip from there.